@Acidic and basic are two extremes that describe a chemical property chemicals. Mixing acids and bases can cancel out or neutralize their extreme effects. A substance that is neither acidic nor basic is neutral. The pH scale measures how acidic or basic a substance is. The pH scale ranges from 0 to 14. A pH of 7 is neutral. A pH less than 7 is acidic. A pH greater than 7 is basic. Pure water is neutral. But when chemicals are mixed with water, the mixture can become either acidic or basic. Examples of acidic substances are vinegar and lemon juice. Lye, milk of magnesia, and ammonia are examples of basic substances. 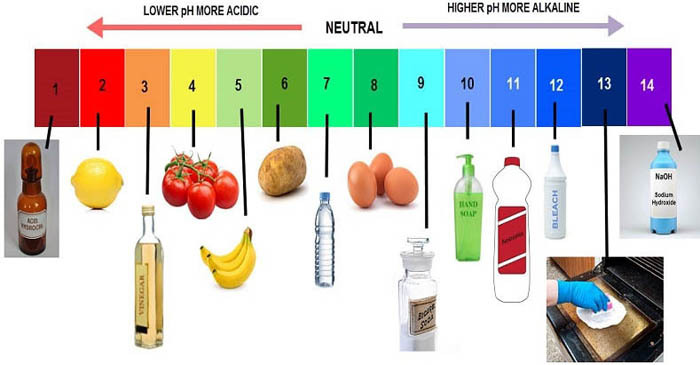 You must know the pH of the food you eat!